Are you struggling to decide whether Trello or Jira would help you track projects more effectively? Looking to learn more about each tool so that you pick the best solution for your team? Because, let’s face it, with so many similarities between the two, the choice seems almost impossible - right? Luckily, there are many subtle differences between Trello and Jira, which make each tool more or less useful in various use cases. In this article, I’ll compare Trello vs. Jira, and give you all the information you need to make the right choice. Trello is an agile project management tool that allows you to organize your team’s projects visually. In Trello, you can create project-related boards for your team, build lists for each project and add cards for each task within the project. Then, within individual cards, you can upload file attachments, add comments, assign due dates, and much more. In short, Trello offers a simple, intuitive way to manage all kinds of projects from squashing visual bugs to planning your company's holiday party. 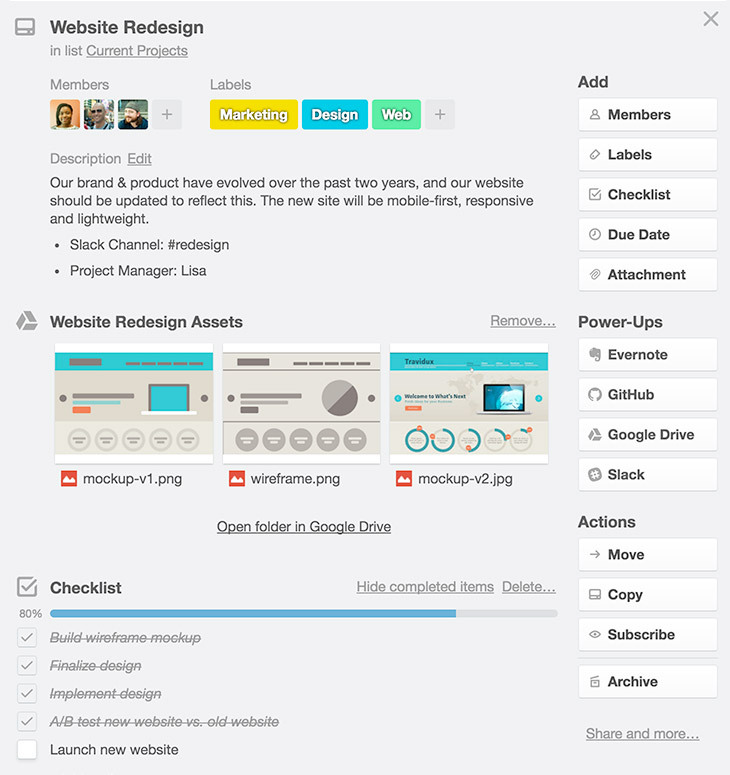 But where does Trello really shine as a project management tool? Let’s take a closer look at its strengths. It’s tough to beat Trello's usability. For example, dragging and dropping cards within lists helps prioritize tasks. And moving them across lists offers the simplest visual cue to track progress. This drag-and-drop functionality carries over to making assignments as well. To assign team members to a task, you simply drag their icons from a single menu to the right cards. This makes divvying up the work within each project fast and easy. With such a simple, smooth interface, your team will have no problem learning the ins and outs. But usability is nothing by itself. You also need great features to support your team’s work. Have you ever worked halfway through a project only to find your team's no longer on the same page? Developers are jumping to the next stage in the project, while the design team is still wrapping up their part. And to top it off, neither team knows what the other is doing. It's frustrating, right? Enter Trello, their collaboration tools ensure that your teams stay in sync at every stage of a project. It’s easy to add or remove teammates from tasks and projects by dragging people icons where they need to be. Teammates can also easily discuss projects by adding comments and attachments - and emojis. Plus, no one will miss a beat with notifications across devices and channels. Trello boards work seamlessly with the Kanban style of agile project management. Re-prioritizing tasks or passing them to the next phase is as simple as dragging a card to the next list. Its flexible task management and emphasis on collaboration make Trello ideal for freelancers and small to medium businesses. In other words, smaller, more agile teams that switch rapidly from project to project will love this tool. Like I mentioned above, project management is this tool’s bread and butter. In Trello, you can organize your work with three vertical levels (boards, lists, and cards) and two horizontal levels (labels and members). And that pretty much gives you everything you need to keep your team organized and working efficiently. Trello lends itself well to tracking bugs. Labelling allows you to prioritize the urgency of each bug, plus you can add screenshots as attachments. Overall, with the right setup it can be a powerful and easy-to-use bug tracking tool. If you’ve ever worked through any software development project, then you know how difficult it can be to stay on the timeline and under budget when the clients introduce a new request halfway through. Developing software using an agile management style like Kanban ensures that your team delivers high-quality software more quickly than ever before. 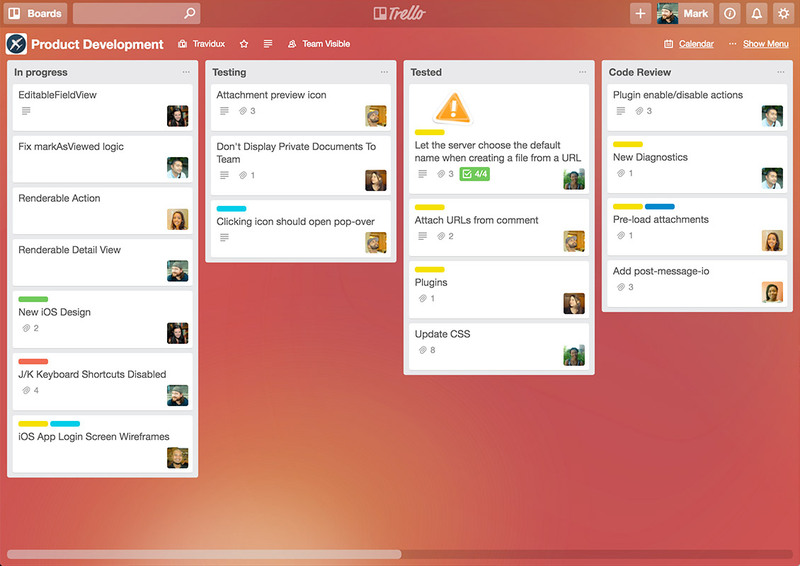 Setting up your Trello boards for a Kanban development team is easy. The drag-and-drop flow between lists and boards allows your team to tackle each task and move quickly to the next. 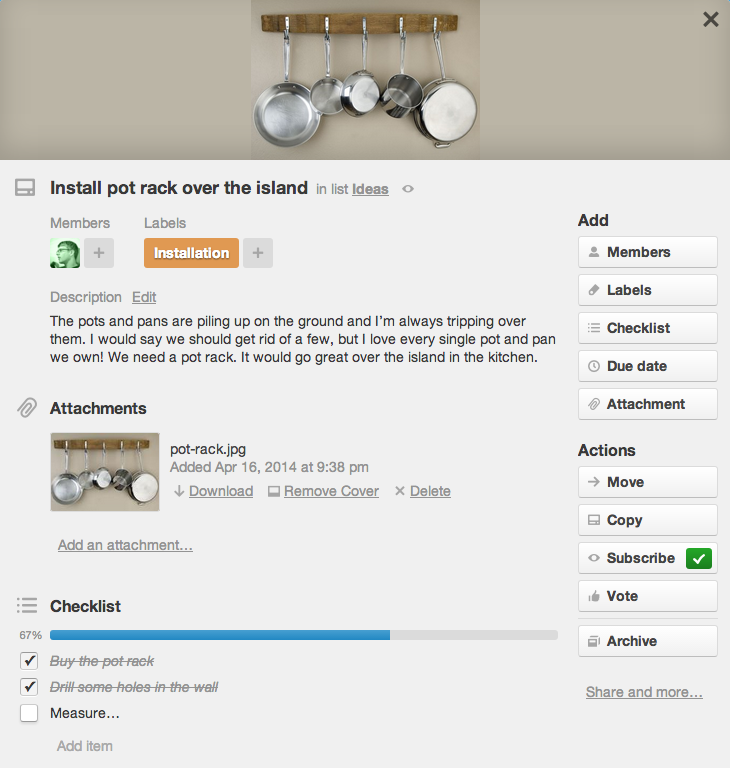 Plus, with Trello’s visual layout, everyone involved can easily follow each project's progress and next. The basic version of Trello is free for anyone. All you have to do is sign up for an account to use unlimited boards, lists, cards, members, checklists and attachments. There are two more advanced account types, including Business Class ($9.99 per user/month) and Enterprise ($20.83 per user/per month) - available through monthly or annual subscriptions. Business Class includes unlimited “Power-ups” (integrations with other tools), custom collections for your teams’ boards, and restricted memberships and user controls. Enterprise adds more in the way of security with file encryption, intrusion detection, and a custom security review. 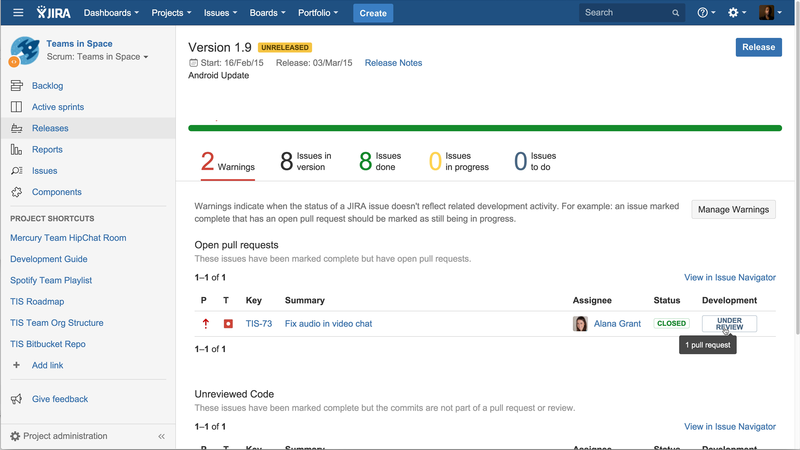 Jira is another powerful, agile development tool that gives you everything you need to track projects, squash bugs, and deliver great software. Similar to Trello, you can manage your work by creating stories for projects and issues for individual tasks. Within these tasks, you can assign team members, create due dates, and discuss details through comments. Unlike Trello, Jira also includes reports like burndown charts to show you how your team works and where you can make improvements. This robust tool packs a lot of power under the hood if you’re willing to learn how to use it. Jira really shines in its management structure and advanced capabilities. It can keep even large teams organized and on track. And what it may lack in intuitive usability, the tool makes up for in powerful features. Time tracking, workflow reporting and document management are just a few examples. Jira was designed specifically for software project tracking. Pre-designed workflows get your team started on testing and releasing software right away. You can also create custom workflows for your other agile projects. The tool allows you to see every issue in a single view, regardless of which project it belongs to. With its diverse features and solid structure, Jira caters more to large teams. Small to medium business with large development teams, as well as enterprise-level teams will most likely be able to get the most out of the extensive features this tool can to offer. Because Jira is already set up with an agile methodology in mind, it’s a natural fit for agile project management. Out-of-the-box templates help you get started right away using whichever agile method suits your team best. The time tracking feature keeps your team on track during sprints. 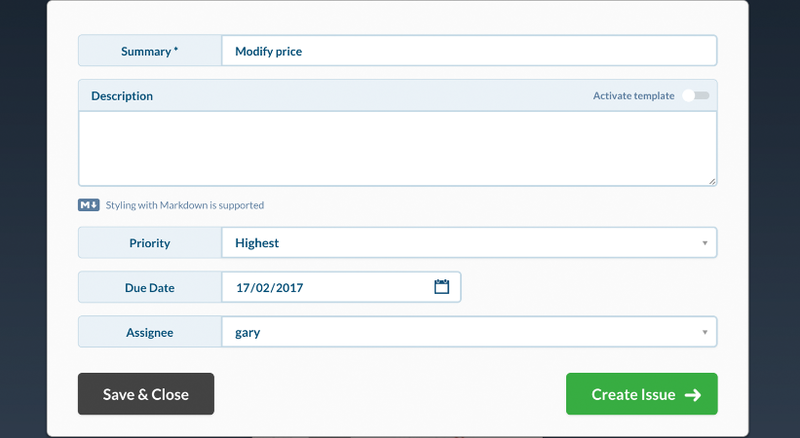 Every member can easily see due dates for their own tasks, as well as the time left in the current sprint. Moreover, document management organizes all of your project documentation right where you need it. 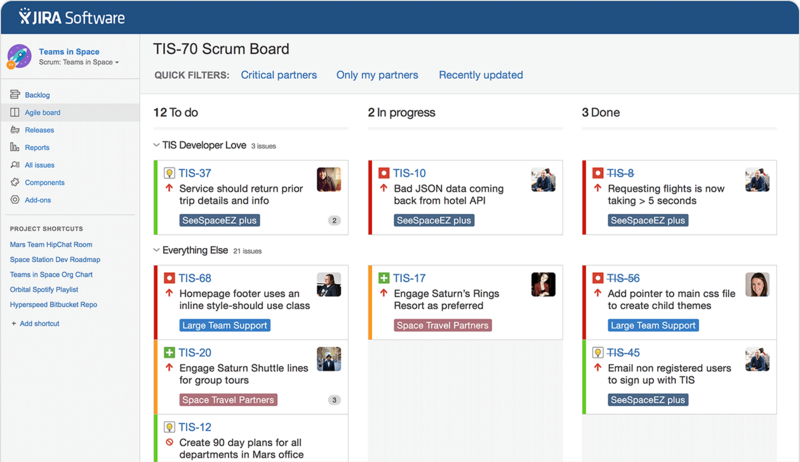 If you’re looking for a tool that’s focused on agile project management above all else, then Jira is a great choice. Bug tracking is one of Jira’s true strengths. You can see all of the issues in a single backlog, which keeps your team working on the right bugs at the right time. Inside each bug ticket, you can assign team members and designate priority levels by dragging and dropping it wherever you want it in your backlog. As the bug moves through the workflow, notifications will automatically keep team members up to date. Keeping all of your team members on the same page will also ensure that you’re releasing software with confidence. 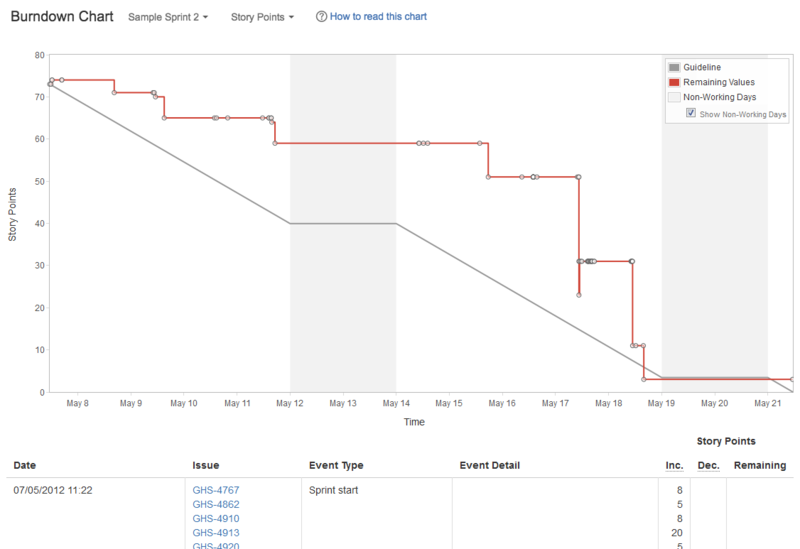 Jira’s structure naturally lends itself to Scrum teams. You can maintain an up-to-date backlog, designate sprint timelines, keep track of daily scrums, and track key milestones. 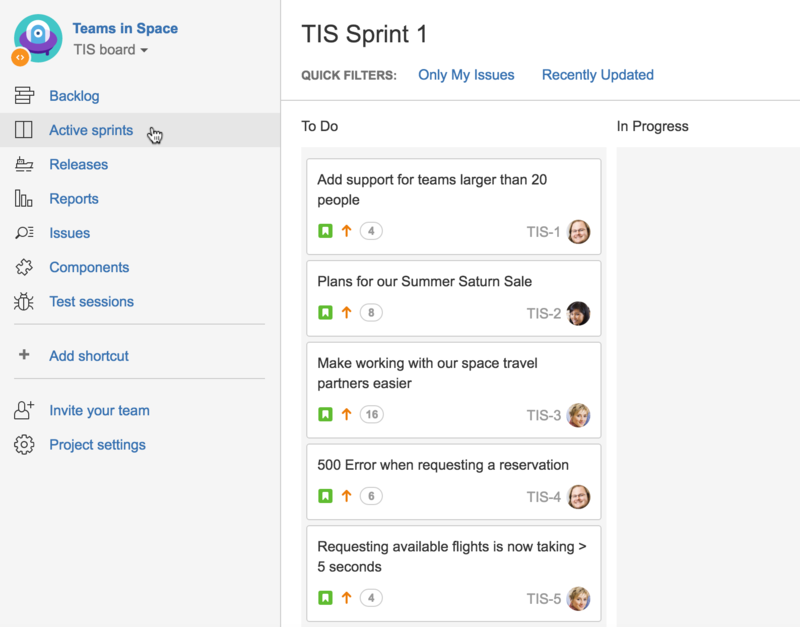 The tool can also support Kanban teams in their workflows. In fact, whenever you begin a new project, you can select the project type: Scrum or Kanban. 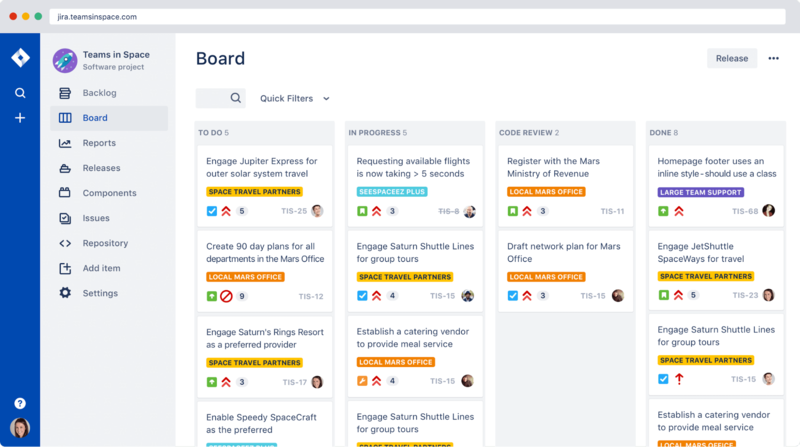 As soon as you select, the tool automatically creates either a Kanban or Scrum board to get your project going. Jira’s licensing starts at $10 per month for teams of one to ten people. The price jump for teams larger than ten is considerable, so some smaller businesses might find the tool cost-prohibitive. Jira offers monthly or annual contracts, as well as on-premise deployment with perpetual licenses. Speaking of integrations, choosing the right add-ons can guarantee you get the most out of your project management tool, whether you choose Trello or Jira. Although each tool offers a wealth of functionality by itself, you can improve your workflow and tailor it to your team with some of these additional tools. Here are some of the top add-ons for both Trello and Jira, so you can maximize your agile project management experience. Capture bug reports and client feedback from any website with a variety of capture methods, including keyboard shortcuts. You can include notes directly on each image, so team members will understand the issue and how to fix it at a glance. Best of all, your team can create detailed Trello cards from these bug reports with just a few clicks. Add agile project dashboards to your Trello boards that show important data like burndown charts, cumulative flow diagrams, cycle time charts, and more. Ramp up your team’s productivity with the Pomodoro technique. You can turn each Trello card into a simple 20-minute task. Track workflow time with the Harvest app without ever leaving Trello. View your progress in Gantt charts attached to all of your Trello boards. Elegantt provides more drilled-down status reports to give you a better perspective of what’s going on. Marker.io also works for Jira, allowing you to capture bug reports and client feedback whenever you need to. In just a few clicks, you can create a Jira issue associated with the bug. Tempo Timesheets makes for painless time tracking within Jira. Get a greater understanding of the time spent on each project and throughout your organization. BigGantt gives you access to more efficient planning and simplified project portfolio management. 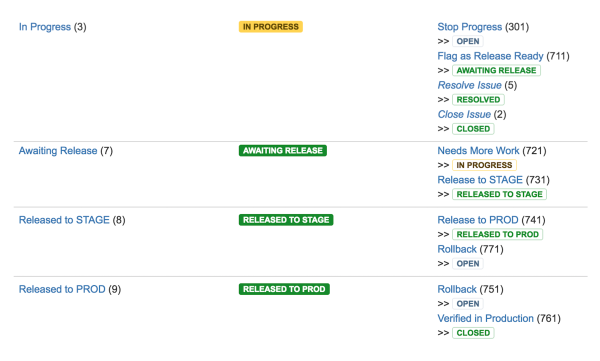 Visualize and track every project right in Jira. Create diagrams with the leading diagramming technology. Draw.io is easy-to-use and offers you full privacy and security for your diagrams. You now know the benefits of both Trello and Jira, and what make them great tools. But there are still a few key factors to consider when choosing which one is best for you. First, consider the size of your team and whether or not it is likely to expand soon. 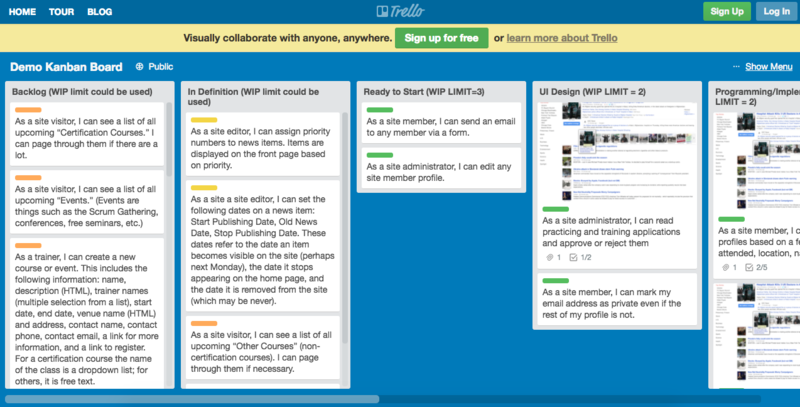 You don’t want to subscribe to Trello today only to outgrow its capabilities in a few months. Likewise, you don’t want to choose Jira with its robust features when your small team is only going to use a fraction of them. Second, determine what types of projects your team will be managing within the tool. Jira is dedicated to agile software development, so managing other projects may be challenging. On the other hand, Trello offers flexibility that might be unnecessary if your team is focused on software development alone. Third, decide what you need from this new tool. If you’re looking for a simple solution that your team can adopt quickly, Trello is an excellent choice. It’s easy to pick up and learn; but it’s also more limited in features. However, if you’re looking for a tool that can do it all with agile project management, Jira easily meets the challenge. It provides a number of powerful features, but may also take some time to master. To choose the right tool, make sure you truly understand your team and their needs. Whether you’re a fast-moving team that lives and breathes collaboration, or a more structured, regimented team that can’t imagine life without Scrum, you need a project management tool that will support your hard work. Measure the pros and cons of Trello and Jira for your own workflows and style, then choose the tool that helps your team excel.